Kept Indoors? I Don’t Think So.. I asked the original owner of this bike, a person who’d owned it from new all the way back to 1976, if it had been left outdoors. I believe she took a slight offence. She replied with a resounding “no”, looking rather peeved. But after having worked on this bike for the last 5 days, I’m convinced it was exposed to the elements for years. If we went to argue the case in front of a judge I’d been pretty confident I’d win the case. There’s just no way a bike can fall into this heavily rusted state without being left outside. The state of the Campagnolo rear derailleur was proof enough that it had been treated with complete neglect. This is a 5 speed bike, and a bit quirky as I’ve previously stated. At least the crank is cotterless, which is always a bonus in my view. The single crank ring is a 48t, pulling on a standard freewheel of 14 – 24t, so the bike certainly wasn’t made for hill climbing. I think a 42t crank would have been better for a get-around bike like this. Regardless, I desired to get the thing off to clean it properly. It’s a Japanese made crank, Silstar ( SR ), so should have been less problematic than a French brand, right? Ha ha!! I was wrong about this one. I’ve often complained about Stronglight dust caps, and this one looked pretty similar, made of hard plastic, rather cheap. I used my well tried and tested method to remove it, using a snug-fitting thick washer to begin turning the cap. I was doing it by hand, very carefully, being aware of the dangers of turning old plastic threads. It didn’t move. So I tried a little harder, then snap! The bloody cap exploded in pieces and all over the floor. It was so brittle, it just couldn’t cope with even the pressure by hand. So now I had to dig out the rest of the cap that still stuck inside and around the crank bolt. Wonderful. All is not lost, I thought. I managed to get the rest of the brittle plastic out using a wooden pointy tool, not a metal one, as I didn’t want to ruin the threads. But that was a waste of time, because the crank had already hatched plans to ruin my afternoon anyway. I took the crank bolt out which was quite an easy task, but then when I got to the meaty part, beginning to turn the crank puller with decent force, it became immediately clear that the threads were shot. Thin rinds of them were peeling away with every strong turn of the tool, and after just a couple of tries, it was all over. The puller tool had no threads to hold in place. You won, crank; you’re not ever coming off. I had to glue the smitherined dust cap together again, and fit it back in place feeling rather frustrated. To raise my mood, I turned to the Campagnolo transmission which was, perhaps, the best feature of this bike. My god, the Valentino Extra rear derailleur was so incredibly messed up. You could barely even see metal, it was so dirty, sat in a grunge and the colour of gross brown. Not a normal brown; a sort of malaise brown, dead brown. It was dead, completely. Could it come back to life? I’ll be doing an article on these derailleurs very soon. I’ve never seen a pair of tough old centrepulls in such a mess. These Weinmann calipers, 750/999 for the front, 610/999 on the back, were in a right state. They could barely move, even when you pushed the pads together by hand. By my reckoning, I think they had not been used for at least twenty years. The grime was thick, deep and a bit weird in parts. Nevertheless, I know these calipers well, and I’ve seen them come back from near extinction before. They are very hardy, and after a good deep clean, sprayed with some WD40, pressed and pulled apart again and again, they came back to life. All hail Weinmann brakes! The pads are a bit on the worn side, though. 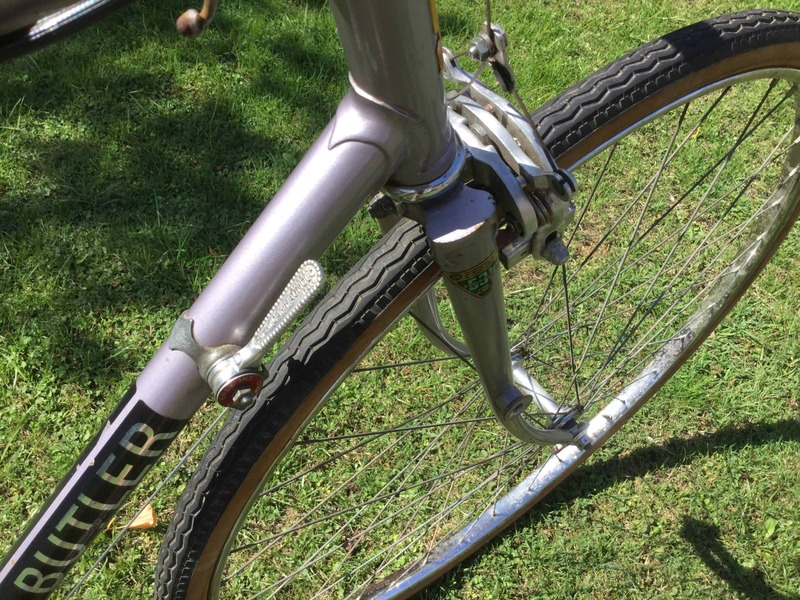 When I saw the listing for this bike, I did think from the single photograph provided that the lilac frameset was the best thing about the whole bike. It looked dirty and dulled by neglect, but underneath that film of filth I could see a very attractive frame desperate for some care. With just a sponge and soapy water, the results were amazing: the sparkle came back to the tubes, and the colour glistened again as the finish on the bike was not compromised. Of course, there are some rusty chips on the top tube that can’t be repaired, but that’s expected on a vintage bike. Seeing the condition of the wheels, it’s quite amazing that the frame came out of this death slumber so unscathed. How Good is this Frame? Poor quality paintwork always scratches easily, so if you are too heavy handed with your cleaning you can easily cause scratches or swirls in the finish. In this case, the Electron frame was highly tolerant of rubbing and cleaning methods, which is a sign of the quality of the paint on this frame. I like the simple but elegant Prugnat lugs, the crown forks, the lovely head badge and the attention to detail of the frame builder: the braze-on pump hooks and the braze-on cable guides instead of the use of brake housing clamps that are more typical of this era. It is simple and elegant frame building, and though it would have been an affordable bike in its day, there would have been a sense of pride to own a nice bike like this in 1976. The Weinmann brakes got back on their feet like John Wayne after a bar fight, tough as nails are these old Vainqueurs. Tougher than Mafac Racers? Perhaps. Their springs were not damaged by the decades of rain and damp, of sitting in one position. It took them about 5 minutes of exercise to reclaim their position as effective stoppers to this bike. Unfortunately, the original pads ( red ones which I like ), didn’t fare so well and need to be changed. This is down to actual wear from braking than to any slow rotting or decay. Because they were not correctly aligned with the rims, they got worn unevenly, which ruins their effectiveness and shortens their life. It may not be the lightest or celebrated derailleur, but this Valentino Extra derailleur is a solid performer. It may not shift as well as a Super LJ, but it moved across the five speed freewheel like clockwork. There was no skipping or hesitation, and the hi lo adjustments were really accurate so you could really get precision on each gear change. However, there was a problem: I think the derailleur is slightly bent, affecting the position of the lower jockey cage, causing it to stick out too much towards the spokes. So yes, the derailleur easily made the jump to the lowest cog of 24 teeth, but the cage was hitting the spokes. I tried to straighten it by hand but I certainly didn’t want to break this old derailleur, but it didn’t really help. The fix to this problem is in a video repair, here. Quiet as any bike I’ve ridden. More comfortable than many too, as those big, heavy 27¼ rims with their good quality Wolber tyres felt great on the typical bad road surfaces. The Campagnolo shifting had no straining, i could feel confident to get out the saddle and push hard without fear of any chain skipping. The bike weighs around 26lbs, so it’s certainly no match for a Holdsworth or even a Carlton Pro Am, but the frame geometry felt comfortable and it’s a bike you could ride around on all day and not feel back strain. The only issue I had was the braking noise on the pads; both rims have rust of their side walls, feeling rough to the touch, hence the rasping noises when the pads hit them. Probably a new set of wheels would make this bike ideal.